Blame it on Harry Potter. The Warner Brothers movie "Legend of the Guardians" that features Potter and his snowy owl sidekick, Hogwarts, encourages the thinking that owl care is easy and owning one as a pet is acceptable. However, India is now facing an endangered owl crisis thanks to popular movies depicting owls as pets. And while it can be quite common and enjoyable to have a pet parrot or another domestic bird, the same is not true for this bird of prey. And in fact, it's downright illegal to own one in North America. The beautiful white snowy owl—with its striking yellow eyes and black beak—is native to the Arctic regions of North America and Eurasia north of latitude 60˚. And while Arctic conditions are preferred, this nomadic creature has been known to migrate south, following its prey and breeding at more southerly latitudes. Similar to its close relative, the great horned owl, the snowy owl eats small mammals, other small birds, and insects. It catches prey with its large talons and sharp beak. And it uses its unique owl features—including night vision, keen hearing, and an aerodynamic body—to transform itself into a silent but deadly predator. This predator does have its own environmental threats, however, including Arctic foxes, corvids, gray wolves, and other avian specimens. And both male and female owls defend their nests by dive-bombing and attacking threateners, as well as conducting diverting displays to distract them. But their distraction efforts prove no use when it comes to human threats. Once one of the most persecuted owls in North America due to sport and trophy status, this species was labeled "vulnerable" in 2017, estimating a total remaining population size of 28,000 birds worldwide. This large bird of prey has a wingspan of 20 to 27 inches. And while male owls are larger and weigh more than their female counterpart, the average owl weighs in at 4 1/2 pounds. 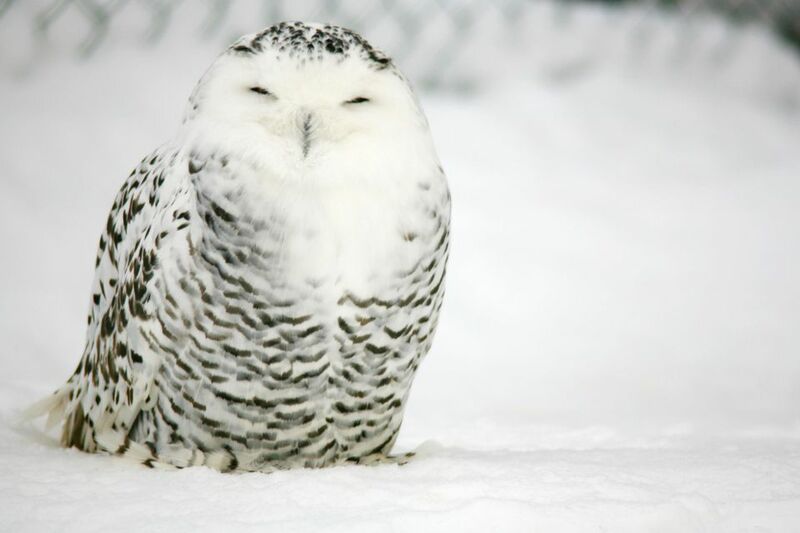 In the wild, snowy owls can live over 9 years, with the oldest owl on record reaching 9 years and 5 months of age. In captive, however, the oldest recorded snowy owl was 28-years-old. Owls don't talk, so don't liken them to a parrot if you're considering one as a pet. And, since they're most active at night and rely on sizable live prey as their main diet, they don't make a good one, either. In fact, snowy owls are typically solitary and aren't known to be affectionate, toward each other or humans. Additionally, when a cute young chick is raised from birth by a human, it "imprints" on the person feeding it. This type of recognition makes it think it is human, too. And then once sexual maturity hits and natural instincts kick in, this results in the pet owl viewing its owner as either a mate or a threat. This owl, one of the largest species in North American, can be recognized by its distinct color and markings. Adult males are almost pure white with random black flecks on the tips of their wings. Females and young birds—while still predominantly white—have dark markings scattered throughout their body and wear a crown of black hits on the feathers of their head. Before committing to pet owl ownership, be aware that their care is a full-time job. Snowy owls, especially those that are human-imprinted, need round the clock care, regular veterinary checkups, and daily exercise. An owl enclosure needs to be a minimum of 20-square-feet with a specially designed perch, complete with a leash. And even if you keep your bird in a pen on its perch, owls cannot be left alone for periods of time and will screech insistently, demanding your attention. Owls, like most birds, go through an annual molt, requiring you to be on top of cage cleaning. During this time, they will dump large quantities of feathers, expel several owl pellets, and poop profusely. Any excrement or discarded feathers left in the enclosure makes a good breeding ground for bacteria, which can then affect the health of your pet owl. Round-the-clock care is needed to assure this doesn't happen. In captivity, owls are fed whole, live (or frozen and thawed) mice, rats, and chicks. This type of prey-based diet (and the fact that you may have to hunt and gut this prey yourself) can be a logistical nightmare for bird owners and something that needs careful consideration. While this detail is never discussed in Hollywood movies, providing sustenance in this form is essential to the wellbeing of your owl. Snowy owls in captivity need to be "flown" every day, requiring the owner and pet to practice falconry techniques together. This technique involves training your owl to fly and then return to a perch on your arm. Similar to sport-hunting falcons, an owl needs to wear a specialized hood to keep it calm during the training period. After training is complete, owners must become licensed by passing a series of tests and acquiring certain equipment. This flying technique, however, is only pertinent for owls that are legal to own stateside. While a more practical approach to exotic bird ownership is acquiring a bird specifically bred to be a pet (and one that is legal to own), such as a Cockatiel or an African grey parrot, to be your companion, there are ways to show your support for these intriguing birds. Adopting an owl that lives in a pet sanctuary or an animal center offers an option for owl lovers. Many sanctuaries help heal injured wild birds or care for wild owls that were initially pets. With a program like this, the owl remains at the center in its special enclosure and professionals at the sanctuary care for the bird properly. Your monetary contribution can provide for an owl's needs, granting you the right to visit the bird anytime. There may be opportunities for more interactive engagement, as well, like helping with feeding or taking part in owl care. Sponsoring an owl both helps a wild animal in need, while also supporting the center who cares for it. Otherwise, check out other bird species profiles that might make a good pet.